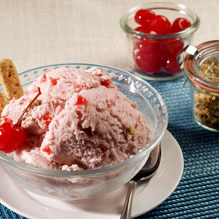 Directions: Fold chopped maraschino cherries and crumbled graham crackers into softened premium vanilla ice cream; freeze. Directions: Heat 3 cups Real California heavy cream and 1 cup Real California milk to just below the boil. Whisk 5 egg yolks, 1/2 cup sugar and a pinch of salt until just blended. Strain hot cream onto egg yolk mixture, whisking constantly. Return to saucepan and cook slowly, stirring constantly, until it coats the spoon. Strain, add 1/4 teaspoon almond extract and one 16-ounce jar drained, chopped maraschino cherries. Cool completely; freeze in ice cream machine according to manufacturer’s directions. Fold in 1 1/2 cups cinnamon graham crackers, broken into 1-inch pieces. Freeze until firm.